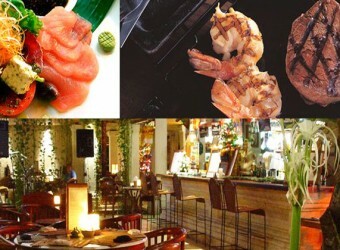 Bali Kori Restaurant is located at Poppies Lane II in the center of Kuta. The restaurant is designed as an open air restaurant with a beautiful lotus garden, provides a cool breeze from Kuta Beach. Kori Restaurant was open in 1998. Here you can enjoy delicious Balinese and Western food. Special menu of this restaurant is giant hanging seafood grill and jumbo spareribs! Both served in large portions and enough for several people. It tasted delicious!